Started work on an ingredient pricing list for use in the future. I know updates have been non-existent and I'm sorry, although I doubt many people are reading this. Life has taken another bad turn but I'm thinking cooking may help me take my mind off things. When I start posting recipes again I'll be adding price estimates. For some items it'll be estimates rather than an actual price (herbs and spices I'm estimating between 5p and 10p a 'use' unless something asks for a lot of it). Prices will also be based on a supermarket for two reasons: reason one, despite having reasonable access to a market where I can get fruit and veg cheap, I understand not everyone will have this available to them. Reason two, supermarket prices tend not to vary geographically in the UK so someone from Glasgow could expect to cook something of a reasonably similar price to me. Prices do not include special offers but may include simpler versions -- if honey in a recipe is simply to give it sweetness I won't bother with stuff like "Spanish lavender" honey and instead get the more typical honey. I first came across this recipe a good few months ago, then for a simple milk chocolate cookie bar. Curious, I tried it and loved it -- however, the recipe I followed didn't (to my eye) look correct, so I deviated slightly. Copious notes adorned the printout, partly from adjusting the ingredient amounts, but also partly changing the ingredient amounts from cups to grams, and cooking temperature from Fahrenheit to Celsius. 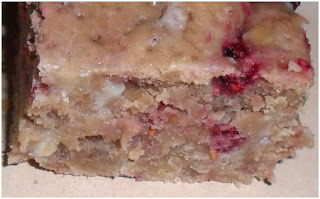 My next attempt at making these, I tried to use store-bought, dried raspberry. 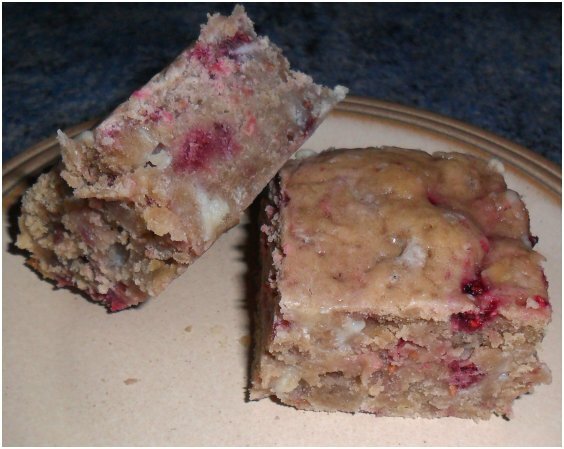 It wasn't raspberry, though, more of a mashed-up puree with flavourings and stabilisers, the end result being that the 'raspberry' melted and disappeared in to the batter. I tasted them and found them disappointing (but my husband ate them anyway). I tried looking for proper, 100% dried raspberries but they were pretty expensive. This attempt, I used frozen raspberries, which I had used to good effect in muffins (so good, in fact, that my boss/friend asked for the recipe when I made some for a company get-together). It's been miserable weather here the past few days, and these are a good pick-me-up heading in to December. Cream the butter and sugar together, making sure to scrape down the sides of the bowl. Gently add in the eggs and vanilla and mix until combined. Add the flour, salt, and baking soda and mix together until combined in to a smooth dough. Mix in the chocolate chips and carefully fold in the raspberries (you don't want to mix in to vigorously as they'll break apart and leave you with raspberry-infused dough, rather than chunks of raspberry). Cook in an oven at 170C/340F for 30-35 minutes until a golden brown on top or a knife or skewer through the centre comes out clean. Leave to cool down before eating. Store in an air-tight container (although I doubt these will last long: made on Monday evening and by Wednesday lunchtime my husband and I had eaten half the batch). All information on this blog, unless otherwise stated, is (C) One Bowl Wonder, 2012. Simple theme. Theme images by Maliketh. Powered by Blogger.